In my last post, I talked about how the most nutrient-dense, high-antioxidant vegetables (i.e. the vegetables closest to their wild/weedy/herbal state) tend to be the lowest in carbohydrate, and most of their carbohydrate is fiber. I suggested this makes them ideal ketogenic diet foods for many people, partly because they are great fat-delivery vehicles. "I mean that both from the culinary perspective, in that oily dressings or sauces combine beautifully with vegetables, and from the nutritional perspective, in that many of the micronutrients in vegetables are fat-soluble (notably vitamins A and K1 and the carotenoid antioxidants), while the vegetables themselves aid in the breakdown of fat (the acid in sour vegetables helps to emulsify the fat; bitter compounds in vegetables prepare the liver to break the fat down into its constituent parts)." So--pesto! A perfectly ketogenic application of herby vegetables combined with the well-structured oils that form the basis of our body’s fuel. Think “pestle (and mortar)”--pesto is literally a ground-up concoction. 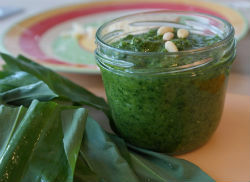 Yes, a paste, but actually paste and pesto are unconnected words etymologically speaking. The “original” 16th-century Genovese pesto was a pestled mixture of basil, garlic, olive oil, pine nuts, parmesan cheese, and salt. But since the word refers to a technique, it’s no surprise that the variety of preparations that can be called pesto are only limited by available ingredients and the preparer’s imagination. If you want the echt, ur-form pesto, you must specify pesto alla genovese. Pesto can be as simple as a bunch of basil blended in olive oil with a dash of vinegar, a pinch of salt, and a little ascorbic acid to keep its color and liveliness. Or it can be as complex as a combination of several herbs (parsley-basil-arugula-mint is delightful) with pine nuts or other nuts or seeds, (and yes, with cheese (usually parmesan or pecorino romano); I never do this, so I forget to mention it), as well as the olive oil/salt/ ascorbic acid. Some people like to add nutritional yeast (which some think confers vegan cheesiness), or wine vinegars, or lemon. Some people like a very loose, runny paste, closer to the French pistou (made without the nuts and often without the cheese); some like to keep some discrete leafy texture; some like it almost hummus-like. When I lived in Alaska, I made endless nettle pesto when the nettles galloped up out of the ground during “breakup” every winter’s end (i.e. May/June). I grew cilantro every summer too, and cilantro pesto was a wonderful ally when I was chelating heavy metals one year: cilantro itself is a heavy-metal chelator, and I made the pesto with pumpkin seeds, which are rich in important minerals (chelating inevitably displaces some of the “good” minerals along with the toxic metals). In Arizona, I’ve made it with mallow, with basil, with nettles, and probably most often with arugula (featured vegetable in the previous post on the subject). Pumpkin seeds are lovely in there; pine nuts are traditional, and I’ve seen cashews used as a cheaper substitute for them. I wouldn’t recommend cashews--much too high in carbohydrate, and major mold-contamination issues among other problems with those. But hemp seeds are excellent in pesto, walnuts are nice too, sunflower seeds work well, and I’ve even used almonds to good effect. Nuts and seeds overall are a “suspect food” for the ketogenic diet for a whole variety of reasons I had to figure out the hard way, and I have lots more to say about them coming up soon. This doesn’t mean they’re a problem for everyone, but caution is advisable. That said, while you can make great pesto without any, pesto is a good way to include some nuts and seeds if you’re going to. It’s nice if you can soak them first. The texture of the pesto will be different depending on whether your nuts and seeds are wet or dry (chunkier and wetter with wet nuts, smoother and oilier, more traditionally pesto-ey with dry nuts). You can have it both ways if you invest the (mostly passive) pre-prep time to soak and then dry the nuts/seeds. Something acidic--many people use lemon; I prefer apple cider vinegar, a superstar of the ketogenic diet in its own right. I’ve been making all kinds of herbal vinegars lately too, and these can enhance the food-as-medicine quality of a pesto as well as its flavor. I can’t tolerate garlic, but if I want a hint of that basil-garlic-olive oil flavor combination, undeniably glorious, I can use some garlic vinegar which, in small doses, I seem to tolerate better. As far as preparation, there’s something wonderfully aromatic and wholesome and, perhaps, atavistic about making pesto in the pestle and mortar. The satisfaction of using one’s elbow grease, the observation of minute changes, the immediacy of odor and color. There’s something wonderfully convenient and straightforward about making pesto in a blender (if you want something pastier or hummus-like) or in a food-processor with the S-blade (if you want something chunkier and more textured. When I say it that way, I have to acknowledge how often convenience is paramount in my decision-making; mostly, I use the blender. But then I prefer the more homogenized texture--it sticks in my teeth less! Blend, use food processor, or pestle-and-mortar to desired texture! And what do we eat it with? The possibilities, as they say, are limited only by your imagination--oh, and your ketogenic diet ratios! As for pesto pasta, if you don’t know about shirataki noodles, aka miracle noodles yet, I’ve been introducing people to these in real life for years now, and it’s time I gave them a mention here. Marketed for westerners it’s usually sold as noodles; at Asian markets it can be found both as noodles and in blocks you can cut to your desired size. When I first started playing around with shirataki noodles, I was afraid they were too good to be true; either they would taste terrible or they would turn out to be starchier/higher glycemic/more carby than they claimed to be. In fact, they have a very neutral flavor. Depending on the brand, you may need to cut them down to a manageable length. It’s a good idea to rinse them when you open the package, store unused portion in water, do not let them dry out, and definitely do not let them freeze. They take on flavors very readily, and although their texture certainly is not the same as that of durum wheat semolina, it’s a very pleasant texture. I’m aware that because I have no habituation to gluten-containing foods I may be easier to please -- I don’t have any hankering for the true flavor and texture gluten provides. People who “have their mouth set” for a certain beloved spaghetti might be harder to please, but I encourage you to keep an open mind. You really can have pesto pasta with a few sliced cherry tomatoes (if you can handle nightshades), cheese (if you can handle dairy), and whatever protein you choose to enjoy (a can of worms I’ll open in a later post). But not only are they more than viable from a culinary standpoint, they’re actually potentially healthful and beneficial. Recall that they’re made from the same soluble fiber (konjac glucommannan) that you can buy as a white powder, sometimes promoted as a weight-loss supplement because it promotes feelings of satiation. Soluble fiber has other benefits worth knowing about as well. It feeds beneficial gut bacteria, and there is now some talk about several soluble fibers, including glucomannan, being helpful in pulling toxins from the system. Most of the studies I’ve been able to read are animal studies, and they are not unequivocal, but it’s an interesting possibility. Avoiding most fiber, contrary to what many people recommend whether or not you’re doing a ketogenic diet, has been a huge part of my healing/dialing in my personal ketogenic program, and glucomannan is one of the few forms of fiber I still occasionally incorporate. I’ve known some people feel better with more rather than less fiber, so this is clearly a highly individual issue, with much more to be said about it.